The tech-savvy generation of today are true believers of the internet and backpack never bother to a plan and that can lead them into a disaster. India is renowned for its uncertainties and it's not easy to figure the country out without any guidance. Hiring the services of reputed travel agents for India tour arises as a tour of the entire country is impossible for a short time. To travel in India safely you need a perfect companion to overcome all obstacles to ensure that you have a perfect vacation with treasured travel experience. 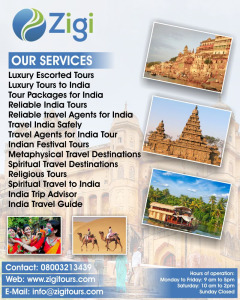 Zigi Associates Limited is the leading travel company offering best travel service starting from tour packages for India to offering travel agents the tour and complete assistance throughout the tour that is all done with expert precision.